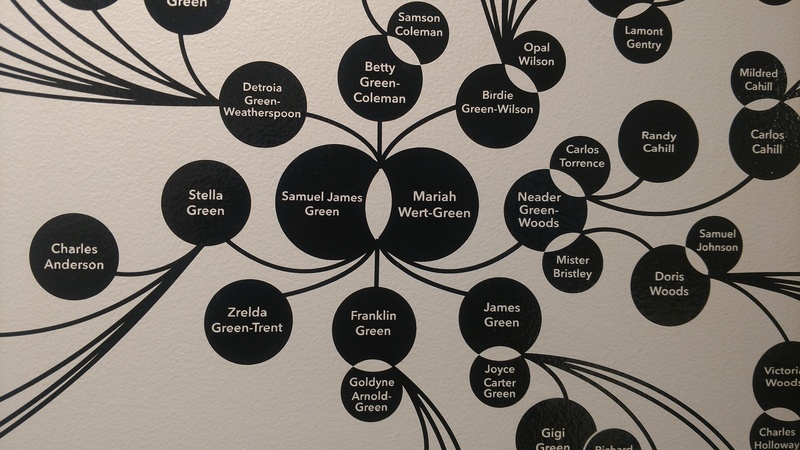 The Green Family Constellation, as installed in the exhibit ‘An Elegant Utility’ at the Northwest African American Museum. 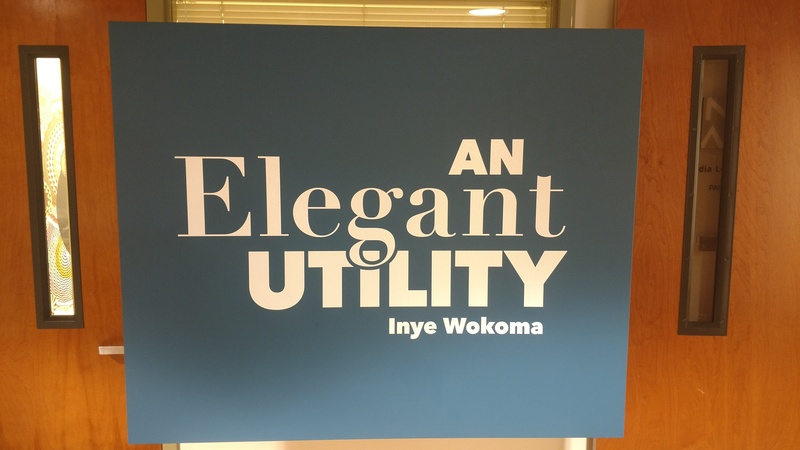 This graphic started with a request from Serenity Wise-Thurman for a family tree as a part of my show ‘An Elegant Utility’, on display at the Northwest African American Museum from January 28 – May 28, 2017. 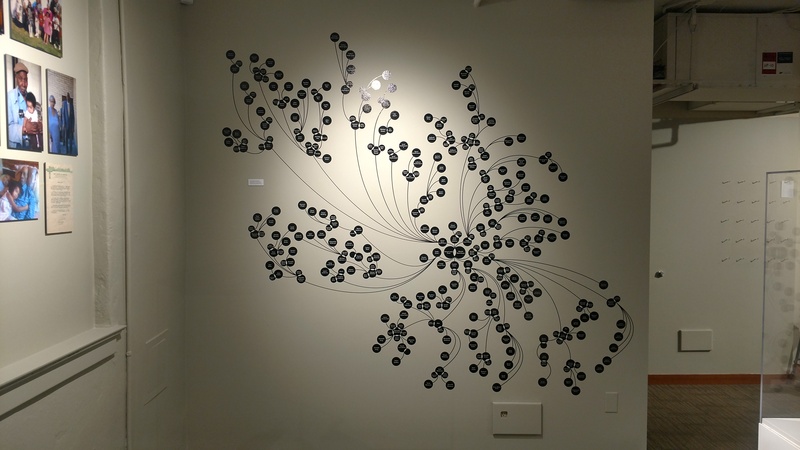 Somewhere in the process of putting the show together the vision of circles came to me as essential to the form. So instead of creating a ‘tree’, or some other linear branching form, this image emerged. For me looking at the completed graphic is a kind of revelation. Seeing my maternal great grandparents, Samuel and Mariah Green, in the center of this constellation clarified something that I had simply taken for granted for most of my life; that their lives represent a kind of genesis story, a cosmic point of origin for how I understand and experience my family. From my arm down in the lower quadrant I can locate relatives on another family arm in an opposing quadrant and testify to relationships that are just as powerful and essential as those I have with my immediate brothers and sisters. As such this graphic is a cipher, essential to accessing a deeper understanding of who I am in this world. As powerful as this graphic is, it is incomplete. It shows my family in terms of my blood relations. However, there is a deeper reality that is too complex for this two dimensional rendition. There are those in our family who are not blood descendants of Samuel and Mariah but are no less family than those represented in this graphic. What binds us together is love, consent, commitment, responsibility to one another, and shared lives. These bonds are unbreakable and in some ways represent an evolution of the bonds of blood. These bonds of consent, entered into voluntarily and shared collectively, are regarded as lifelong commitments. They are a higher expression of our humanity. This is where I reference my Wokoma family history across the ocean in Nigeria. In it every story of family lineage is laced with narratives of people who were adopted, married, purchased (yes, purchased) or in other ways migrated into the family and so there remained, permanent and irremovable by any force such as divorce, deceit or conflict. In any re-telling of family history these people are indistinguishable from blood relatives. There is synergy between the ways the Green and Wokoma families evolved, continents apart. It is rooted in a very ‘African’ way of being. What is taken for granted as a natural way of being in family in Kalabari land in Southern Nigeria, stands out in 20th Century America. And so I cannot help but meditate on the things centuries of enslavement, complete cultural dislocation and unrelenting political and bodily oppression failed to strip us of; this way of creating family as the most essential social institution. It has been and continues to be the key to our survival and the source of our genius. From where I stand Birdie, Neader, Frank, Betty, James, Detroia, Stella and Zrelda, the eight children of Samuel and Mariah, embodied this perfectly and effortlessly. The Galactic Core: Samuel and Mariah Green and their eight children. So coming back to the idea of circles and origin stories, I have chosen to refer to this graphic as the ‘Green Galaxy’. Something about the idea of a living, breathing, growing cosmic entity, made up of interdependent bodies moving together, revolving around a central core, creating new bodies in orbit around themselves, extending the range of diversity and possibility, this appeals to me. We are in orbit together, revolving around a central core and my sense of place and possibility in the world is affirmed. There is an inherent sense of continuity in this. If I can share one essential perspective around which my children can build their identities over the course of their lives, it would be this.